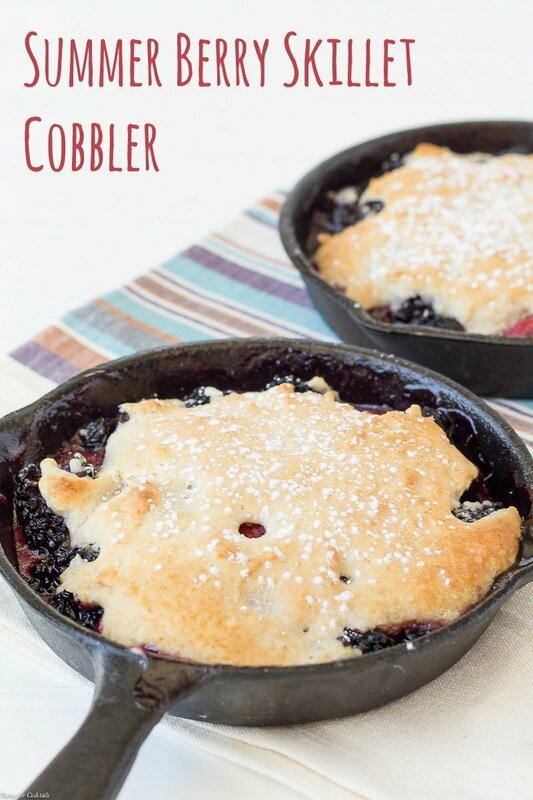 Say goodbye to summer berries by making this easy Summer Berry Skillet Cobbler. Raspberries, blueberries and blackberries with hints of lemon and Amaretto and a sweet, flaky biscuit topping. Today is the last day of summer. For a lot of people that is a sad day, unless you live in Arizona! We are finally getting the cooler weather we long for during the sweltering summer months. 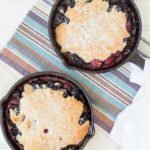 [bctt tweet=”Summer Berry Skillet Cobbler #dessert #summer #berries” username=”thyme4cocktails”] But before we go pumpkin spice everything let’s talk about the last of the summer berries lingering in your produced department. You know they are there, even if it is tough to see past the sheen coming off the apples! Since it is finally cooling off I can run the oven without dropping the A/C several degrees. 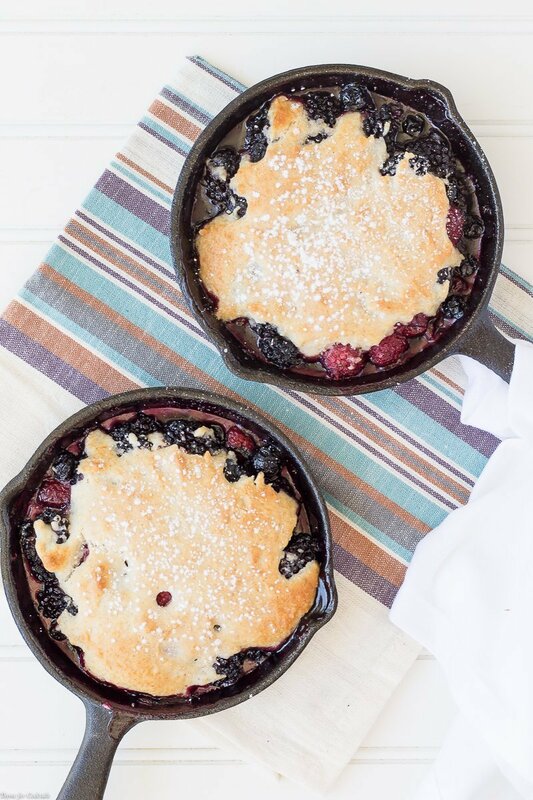 Which was the perfect time to make this super simple Summer Berry Skillet Cobbler. Fresh lemon zest and a hint of Amaretto liqueur really brings out the sweetness of the berries. 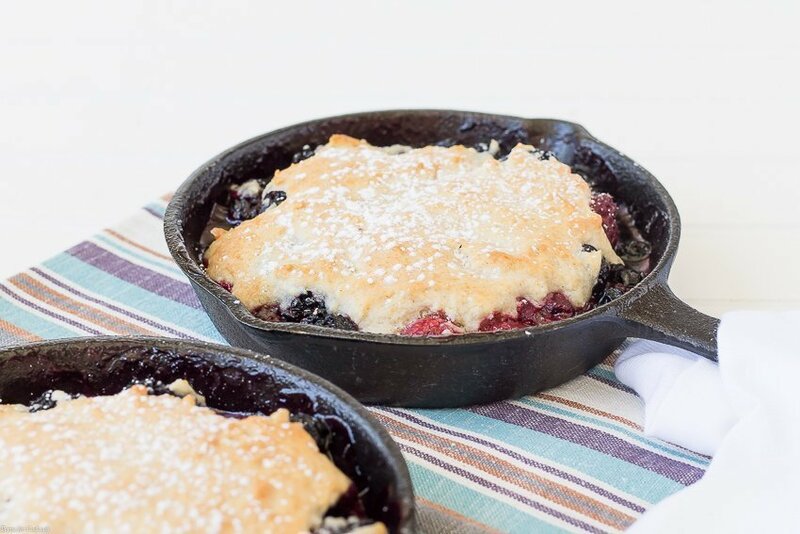 Make the most of those late summer berries by making this easy Summer Berry Skillet Cobbler. Strawberries, blueberries and blackberries with hints of lemon and Amaretto topped with a sweet, flaky biscuit topping. Place berries, 1/4 cup sugar, cornstarch and lemon zest in a large bowl. Toss to coat fruit. Stir in Amaretto, set aside. In a medium bowl whisk together flour, remaining sugar, baking powder and salt. Slow incorporate milk and melted butter into flour mixture. Place berries and liquid into desired baking dish. Spoon biscuit dough over fruit.